The RFU have agreed to help us with in our search for a new coach by including a (free!) advert on their careers page where we sit proudly alongside NEC Harlequins, Moseley, and Bedford Modern School! Has to be said that the page is a bit hidden (but then most of the RFU website is bit of a maze!) but we are in elite company, and it must work or presumably these clubs would not bother using it. This could be a great opportunity to recruit some players for next season. Can anyone spare any time to drop in, talk to the girls (and/or their coaches), give out some leaflets (if we get some done) etc.? If we are quick and get enough volunteers we might even put a small stall up. The RFUW's annual conference at Twickenham on Saturday 16th June, as previously reported. We are sending a couple of delegates already (Andrew and Fern Glenister) but that means are still a couple of places left. Take part in four workshop on such diverse subjects as club development planning, fund raising, using local sports networks, and inter-club partnerships - all from people with real experience in each area. 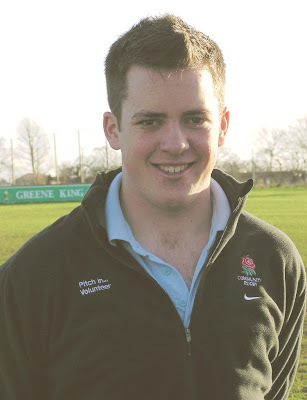 OR Ed Turnhill will be on hand to offer practical advice and assistance to female referees in two equally practical wokshop. AND you get fed as well! If you are interested let me know asap! "He came to watch his sister, and never went home..."
But now Joe is leaving us - the second big farewell that the end of season brings. It as abundantly clear from Joe's first arrival early in our second season that a) he knew what he was talking about, and b) you were all going to listen to him. Those of us who then had you in our charge were therefore more than happy to take a backward step, and then another one, and then another, until we just stood on the touchline and watched. Granted a licence to do more or less as he wished with a real live rugby team - an opportunity that few schoolboys get - Joe's confidence took flight, and his players with him. It was very clear very soon that Joe had a maturity and coaching knowledge several years in advance of his chronological age - indeed the constant call for us to provide a CRB number which the CRB would not provide because he was not old enough resulted in a continual game of administrative tennis that carried on for over a year. It seems that the powers that be simply had never conceived of a 17 year old being head coach of a rugby team - the possibility had not entered the heads of the scribes who had diligently worked on RFU and RFUW welfare rules. Time eventually provided a solution - ie. Joe turned 18 - otherwise we'd be going around in these endless circles still. Admittedly it could have been worse - at no point did anyone ask about who was looking after the welfare of the coach himself - but frankly he always looked as if he could handle that one himself. Admiring all the effort Joe put in, both in training and in preparation, I was often given to wonder whether he actually went to school at all, of if he did whether someone else was doing his homework for him. He put hours into it - send him an email at almost any time of night or day and - "ping" - back would come the reply. But sheer diligence is not enough. Joe knew his stuff - boy did he - and also communicated it brilliantly. Maybe it was the lack of age difference, but I've seen far "better", more "experienced" and better "qualified" coaches make a total hash of coaching girls, because the group psychology of girls sports teams is different. Joe could easily have got it just as wrong by simply repeating the coaching he had received himself - he didn't. He pitched it perfectly from day one. Maybe having sisters helps sometimes. Joe's abilities were soon recognised beyond the club, and he was accepted into the regional structure (in an unofficial capacity - the CRBlessness not helping with any formal appointment). This saw Joe work not just with his contemporaries, but with his seniors too - the East women's team, a formidable team including several players on the fringes of national selection who Joe assisted all the way to finals day and an eventual third place (but for a tough draw and 10 second of madness against South East it would have been a couple of places better, IMHO!). And now the awards were coming in, from the RFU and Herts Sports and.. well, who knows what others there may be yet. If the club could not reward the guy financially some of us strove to make damn sure that he would at least end up with a CV that would practically glow in the dark - a task that Joe made very easy. No need to hype his abilities when what he was achieving provided all the hype he could ever need. And what was that? Well a stack of trophies this season which probably exceeds in number what the rest of the club has achieved put together. And yes - we DO count "Fairplay" trophies as being important, after all what better mark of a good coach could there be? After all with Joe the "good guys" certainly weren't finishing last - this was no sop. When else have you heard of a tournament finalist being also the Fairplay winners? But now Joe moves on to... who knows where? In a few years time will it be the Guinness Premiership, or the Super 14s perhaps? Or one of the leading school or representative sides - or maybe a red rose? Who can say - but his career began here and he is leaving behind a legacy that will not be forgotten. Amazingly there really could be something in this! John Hunter (jshunter40@hotmail.com) is the "IRFU Exiles Branch Development Manager" - and that role includes contacting the Irish Women's RFU if he becomes aware of any girls with Irish qualifications (basically parents or grandparents born in Ireland, north or south, I think) who are of "Provincial standard or higher". Looking back at Worcester's performance on their tour to Ireland this year, I suspect that anyone who has been selected for regional - or even possibly county - rugby might reach that standard. So that means you, Carla! And Sasha too, obviously, though "Basha" may prefer roses to shamrocks. Anyone else want to check their family tree? If you want to take this forward contact Mr Hunter (above) (assuming he does not contact you first) or check out this page on the IRFU website and fill in the form. While everyone else can relax until September (well, late August probably!) Hayley G will be hitting the turf as soon as mid July as she has been called up for the first "High Performance Academy", which will be held in Oxford on 15th July. As you can perhaps expect by now this is quite a complex process (see summary) but basically it puts Hayley on the path to potentially joining Sasha at the "TDGs". The "Academy" in Oxford is essentially a trial that will start with 100 girls from across the country and narrow that down to 20, who will then go to a second event two weeks later where they will be joined by Sasha and her current TDG chums. And from that 50 or so will be selected the 30-strong TDG for 2007/8. Obviously this requires Hayley to be suitably motivated, so if her friends can think of ways of making her annoyed about something (it probably doesn't matter what) on or around the 14th of July this should increase her chances a bit. The scores of all matches in the National Sevens have now been published on the RFUW website, just in case you couldn't keep count, you woke up not believeing that we had actually won something, or your memory was a bit hazy for some reason. The RFUW have also published our report on the event. Superteams 2007: entries now open! Its all FREE and takes place at the Sports Village in Hatfield on Sunday 8th July from 10am to 4pm. We can enter two teams in each age group - that is 14-17, 11-13 and - for the first time this year - 9-11. Age on the day! Thus far I think I have Jess ("Bunchies"), Fern, Carla, Sahsa, and Hayley G "on board" for the U17s (and Pinky has now expressed and interest), so there is room for a couple more (and/or the formation of a new "youth club" if we get too many?) , but I don't have any U14s signed up yet (never mind U11s). Theoretically we need to include at least one male in each team as well - so if you can find a reasonably house-trained example who would not object to representing "Letchworth Girls" that would be useful. There is also no actual requirement for any team-mates to be club members at all - indeed for the U14s this could be an ideal opportunity to bring along a few friends to meet the rest of the squad in the hope that they might be persuaded to join in next season. Closing date for entries is 22nd June - but don't wait until then!! 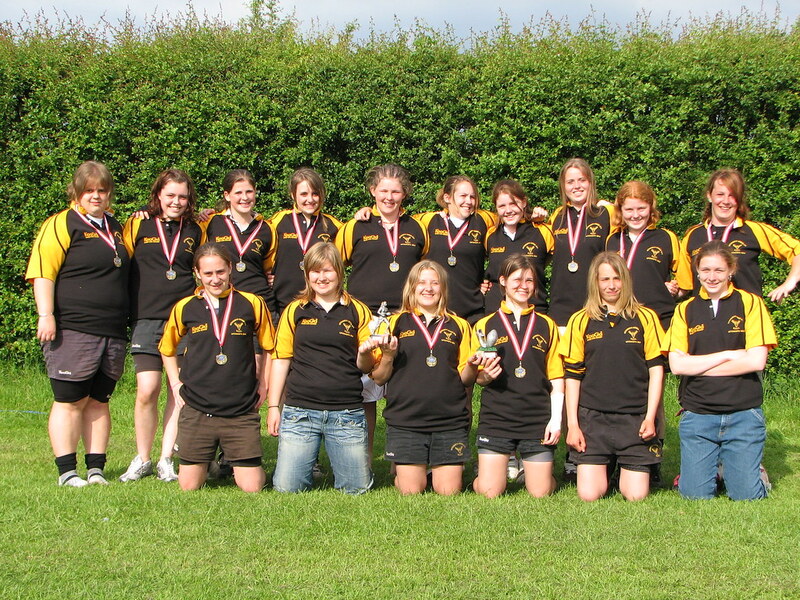 Welcome to Worcester Girls, the latest recruits to the wonderful world of blogging - drop by and say hello at http://worcestergirlsrugby.blogspot.com/. Hitherto Worcester RFC have been remarkably shy about telling the world about their girls, which has always seemed just ever so slightly odd. I mean they are not exactly a bad side, are they? Anyway... after a year of not much its great to see signs that others are following our lead. I hear that Saracens are looking at starting a blog as well, and with the President's XV award there could be more yet! 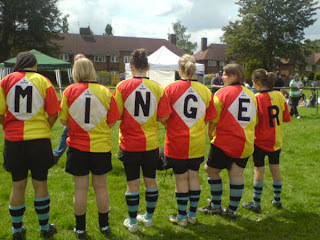 We were the First Garden City, had the first roundabout, and now we've pioneering the girls rugby blog. The Letchworth spirit goes on...! [UPDATE] And also - approaching from the other direction in more ways than one - a welcome to Swaffham Girls' who seem to have started with a blog, and are now building a team round that! No need to trail off to south London - there is a referees course coming up at Letchworth next month (17th and 24th June)! As with other courses its available to anyone aged 14 or over and will be free because the club will pay. All you have to do is let Dave Roberts know that you wish to go, and then complete this form. But don't leave it too late - ideally you should book this week to ensure that you get a place. One day in May. In pictures. Rumour has it that prior to her joining Letchworth, Nim had considered football as a possible sporting career. Given her uncompromising attitude to defence Nim would indeed have been a valuable addition to any team... if it were still the 1970s. 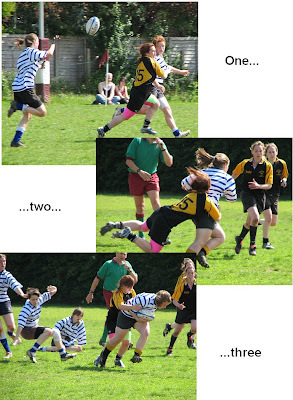 However quite how she would have got on in the modern - practically non-contact - version of this sport (where players fall over in writhing heaps if someone breathes on them too hard) is another matter, and it is perhaps fortunate for everyone that back in October 2004 she decided to give rugby a try instead! It is difficult to believe that we will not see again (in a Letchworth shirt at least) that cobra-like unblinking stare as she lined up her target, the squaring up of the shoulders, the quick skip and then.... pow! - the victim lying on the floor in a heap, or quite frequently over the touchline and into the crowd. Or equally the cross-field chase - like a cheetah closing in on its prey - before the pounce and kill. And all entirely legal. Rarely above the waist let alone higher, Nim's tackles were simply textbook - perfectly timed, fast, targeted, hard-hitting, and lethal. Forget Tango - players knew when they had been Nim'd! In the beginning it took its toll on Nim almost as much as her victims. After the first season her knees were a mess and there was some concern about her playing again at all, but more improvements in technique (and above all timing) seem to have ironed that small problem out. With ball in hand Nim is also a formidable opponent, but scored remarkably few tries overall - most of the time perhaps using her initial impact to open the way for others, invariably Hayley with whom Nim developed an almost psychic (or should that be psychotic?) partnership - never better demonstrated than with the try at Westcliff this season when it was Nim's perfectly timed run to take the ball from Hayley as she was tackled that lead to a crucial score. Not a word spoken - Hayley seemed to know Nim was there and popped the ball up perfectly into her hands. The big mystery was always why regional selectors never seemed to see this, and how Nim rarely seemed to shine in representative games as much as she did at club level. One explanation may be that - when it comes to selection - Nim never responded well to antiseptic adrenalin-less routine of rehearsed drills, especially when these drills rarely gave her any chance to really show what she could do, and - as most selectors refuse to take "reputation" into account - it was only at her third and final attempt that Nim managed to get into the regional squad. So it is at club level that Nim will be most remembered, by teammates and opponents alike. The quiet, even shy, 15 year old of 2004 who was transformed by the game and her friends to become a star. 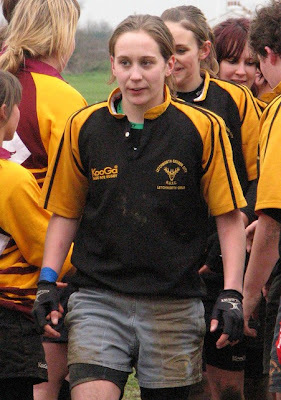 A player whose boots will be almost impossible to fill next season, the first "graduate" of the Letchworth school of girls' rugby, and the "Legends" first true legend. (If anyone wants to add their own memories of playing with - or even against - Nim, please hit the comments link below). Great shame no-one was running a book on the 7s because, if you will permit a certain smugness, I might have done rather well. In addition looks like I also got two out of four quarter-finalists right, plus one plate finalist. Okay, after that it goes a bit awry partly because the effect of the actual draw comes in, but mainly because I had underestimated the strength of Reading and overestimated a couple of others similarly. Incidentally, the actual draw was quite sensible this year (well, aside from the fact that three of the four cup and plate "finalists" came from the same pool!). Either RFUW were lucky or - I wonder - did they seed it this time round? Before today, in two years we had only previously won one game at National Sevens (that is U14s and U17s combined) - but today we trebled that... and won a trophy as well! Okay, The Plate rather than the whole thing, but realistically no-one was likely to beat Worcester - well not us anyway! Still we very nearly made the cup quarter finals - 12-12 with Reading at half-time before losing to them again. They are the only side to beat us all season after we had lead - and they did it twice! But certainly the Berkshire team (and Dorking Sevens champions) did play far better this weekend than last and probably deserved the quarter final place overall. That game had been a straight "winner takes all" after we had both beaten Dorking (in our case 12-10) and lost to Worcester (who beat us "only" 27-0) in the first two pool games, but it put us in the plate - and straight into the semi-finals as two groups had only three teams following the late withdrawal of Welwyn and Tamworth. Initially we were told we'd be facing "Jimmies" but then over the loudspeaker we heard that in fact it was Basford - a game which was richly anticipated both because of our win at Rochford, but also because the day had seen a lot of good natured teasing between the two camps (including - at one point - the purloining of Nim's shirt and boots!). The Rochford game had been close - 5-0 - and this proved just as tight. 12-10 was the final score (I think?) - certainly the lead changed hands several times and it could have gone either way. So to the final. An unchanged semi-final team now faced... Dorking (wasn't this where we came in?) - except this time it was the red-and-whites who scored first. But that was also the last time they crossed the line as Hayley (despite being marked by at least two players) managed four tries - two in each half - to add to the two she had scored against them in the first game and give the "Legends" a 24-5 win. Overall I think I am right in saying that Hayley scored eight of our ten tries on the day, Sasha being the only over player to touch down (one against Reading and one against Basford) - but Nim's kicking also proved vital, being the difference between the teams in two of our three wins. And so the end of the season, the presentations, and then not many dry eyes as both Joe and Nim (plus Pinky and Perky, of course) said their farewells after what had been their last games. There were also not many dry clothes come to that as what was left of 464's water was used in a manner in which it was perhaps not intended (though their bottles make fine water-pistols it seems). Four "galleries" of pictures from Sunday's Herts 7s at Welwyn are now available from the SportsMatters website. ... as well as any number of different team group formations - about a fifth of which feature us, for some reason - including this rather strange photo. What was going on here? Pictures from the 2006 tournament at Letchworth are also still available. The wider club were suitably chastened yesterday evening at the AGM when, having mentioned us in glowing terms on several occasions, the lack of any male players' sisters or daughters in the girls' teams was raised, along with the lack-of-coach problem. Various promises were made to do something about both - and not just by the junior section this time, but by the committee of the whole club. Having raised it now at the highest level, and having had these promises recorded in the club's official minutes, I think we can be as confident as we can hope to be that something will be done. When it comes to attracting players Mike and Heather are working on some promotional material which will be targeted specifically at the female relatives of club members, and Dave Sharp has also asked for a couple of team pictures to go up in the newly redecorated clubhouse (once the painters have left). Mike and Phil are looking for something appropriate, and I expect one picture at least will be the group picture from Beckenham. However, I think it would be good to have a exciting action shot on display as well. Do any of you have any personal favourite pictures that you think would be really effective in attracting new players to "give it a go"? The "final" RFUW calendar for 2007/8. All the dates for trials, national cup, national 10s, national 7s, etc. Apparently a TV documentary on the town is being broadcast next Wednesday on BBC2 (7.00 to 7.50). Doesn't have any rugby in it, but might be worth a look nonetheless. Britain is the most overcrowded of European nations: as a result, we fled in search of rural utopias called garden cities of which Letchworth was the first. A social experiment, its legacy is Britain's ubiquitous, banal sprawl. Yet it all started so charmingly with naked dew-bathers, vegetarian mystics and sandal-makers roaming through Hertfordshire clay fields. If you've not seen Meades before think of a sort of high-brow Jeremy Clarkson who has developed an interest in architecture rather than cars. "But we didn't say anything, referee!" The club's touch rugby "league" begins this week apparently - and there are already calls coming in asking if any of the U17s would like to take part. Games are on Thursday evenings and your popularity may be due to the fact that a team gets a one try start for every female player - so if you all got together and entered your own side you'd start every game with a seven try lead! Failing that, Dave Sharp (Ruby's dad) would be very interested to hear from any U17s who'd be interested in playing. Give him a ring on 01462 627247 or 07860 439837 if you are interested. Suggest he might do a bit of coaching for us next season in return! As well as the results of Sunday's tournament (see the Herts blog) there was also a North East Sevens last month (see Darlington's website) featuring Darlington and Tynedale, with the former beating the latter "narrowly" in the final. If you know about these events well ahead you could base a small tour/weekend away around them, or just make a special long trip (always worth it as with a tournament you know you'll get several games, and probably for both age groups). One of the great ideas behind the Regional 10s was that to give clubs a chance to enter any tournament anywhere - which we took advantage of with our trip to Jimmies. This has come up in the discussion below, but its rather a "fun" topic and might excite a bit of pre-tournament discussion. So if RFUW saw sense and introduced seeding into this event (rather a good idea I reckon, for those who remember last year, or even the year before!) what should the seedings be for Saturday's U17s? 16. Tylderloo (Great U14 side, but U17s? No real record I can find, so really looking at regional performances here. Unfair? Maybe...). Its great that Phil caught this as it was the most memorable sequence of the tournament - or any tournament. Last year it was three tries in a minute, but this year Hayley managed three try-saving tackles in less than 10 seconds. First she out-runs Lizzell (which I have never seen done before), then she tackles the girl Lizzell passes to, and then brings down the next player in line, ball and all, thus ending the attack. It was a big welcome back to Randfield, Private R.
A reminder that the National Sevens this season are on SATURDAY, not Sunday or Monday as in previous years. Turn left towards Toddington. In Toddington at main village green turn right at Bell Public House towards Tebworth. Follow this road through Tebworth for 2.5 miles to a T junction. Turn left onto A5 towards Dunstable. Follow A5 to Roundabout. Turn Right onto A505 Leighton By Pass. Take second right off Bypass ( signposted Stanbridge Road Industrial Estate) LBRFC is half a mile up on right hand side. As you see, six of the teams (in italics) were at Welwyn yesterday so we know what they are capable of at this form of the game, and we've played four of the others this season (Dorking, Exeter, Westcliff and Wimborne) and seen a fifth (Aylestone "Jimmies") in action at tens or the full game. So not many surprises in store. Cramberleigh have a great U14 reputation, and in theory should make waves at U17s but haven't this season. They were due to in our pool for the National Cup, but withdrew due to shortage of players. This shortened form of the game may be what they have been looking for - and they do have some good players (Welwyn borrowed some them for the National Cup semi-finals, I believe). Unpredictable and potentially dangerous then. Tamworth are combined with Burton, the latter having that holy grail of girls rugby an up-to-date website with scores and reports! A big win over MK is included around the time we played them, plus two wins over North Kesteven - who have a strong reputation and some high scoring performances (including one 82-0 win). Tamworth recently lost to Westcliff, other than that... not much around about them. Tylderloo are another combination - Tyldersley and Waterloo - from Lancashire. Their U14 side reach the National Cup final for that age group and the U17s have six Lancashire county girls. Beyond that its a bit quiet out there, and North West (of which Lancashire are a part) were the weakest region this year at U17s. Likely that their main hope will be in the U14 competition. Which leaves us with the North East duo, Darlington and Tynedale. The latter now seems to be the strongest side up there, but have not been to the Sevens for a few years (if at all?). Darlington on the other hand are regulars have always done well. I'd expect at least one of these sides to be semi-finalists at least (depending on draws, of course - the RFUW having never heard of "seeding"!). So... what will be that last ever day of girls U17 (and U14) rugby should be interesting, and unpredictable. Worcester will obviously be favourites, but there are at least four other sides out there who I suspect are capable of beating them. "We coulda been a contender..."
Historically Sevens probably hasn't ever really been our best version of the game - good fun and all that but not playing to where our strengths lay. So its was good today to see what - at U17 level - was probably our best ever performance in a Sevens. 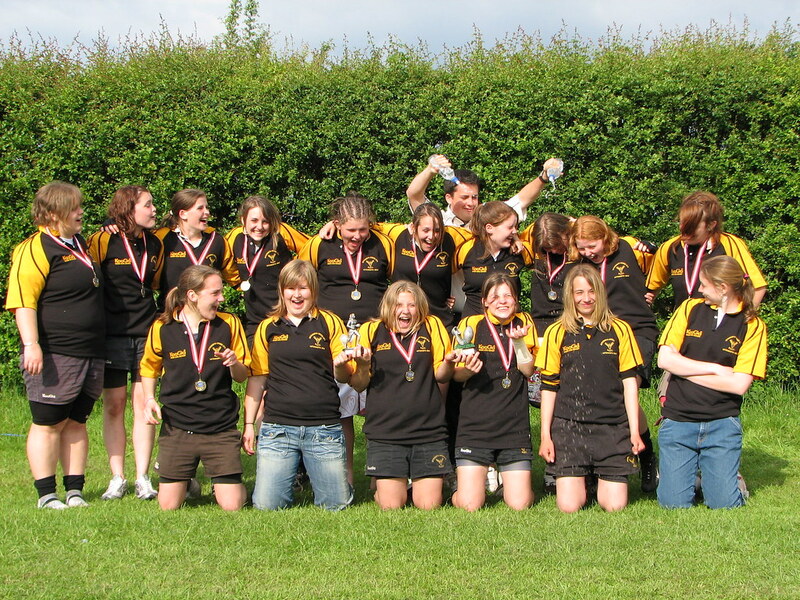 Okay, we reached the U14 final at the first Herts Sevens but that was in another time on a different planet. The game has moved on a tad since then and these days Herts Sevens is easily as strong a tournament as the Nationals was two or three years ago. Plate finalists and overall sixth place may seem a poor reward, but fact is that we comfortably beat the runners-up - Kettering - and might well have taken their place in the final but for some uncharacteristic moments of indecision against Reading (the only game where an U17 team have lost all season having scored first*). Admittedly we very nearly did it again against Eastern Furies in the Plate semi-final thanks to some "brave" coaching decisions by Joe who was determined to make a game of it. Or something. But in the Plate final we certainly worried Paviors/Leicester Forest (who last season we'd have been unable to live with in a competition like this) - until we fell for a well rehearsed sucker-punch, the first of two tries from Emily Scarret (sp), who managed to largely avoid Nim's attentions this time. Incidentally it was also noticeable that all the teams in our group made their respective finals - so it was indeed a tough draw. But all things considered today was a promising "rehersal" for the nationals next week. Who knows where we might get to... if we get a decent draw! *Before anyone says "Hertford" I choose my words carefully -we effectively fielded two different teams that day, one in each half. I've been talking to a few clubs about where they get their players from and the result is interesting - especially from a Letchworth viewpoint because we seem to be a bit unusual. First it has to be said that making direct comparisons between girls' teams is quite tricky as circumstances vary quite a lot. 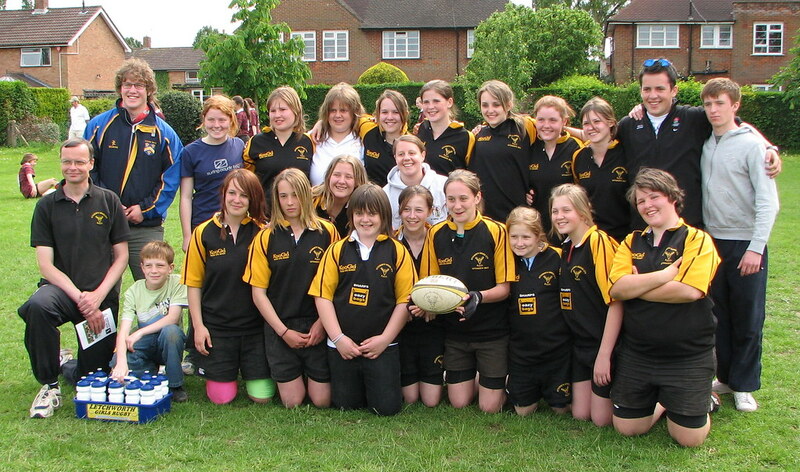 For example, in Hertfordshire girls' teams tend to be attached to specific clubs in the traditional way, ie. as "their" team. In other words although a club may draw in players from a wider area than the town it "represents", it does not claim to be in any sense the "district" or area team. Elsewhere things can be a bit different, and although a team may be based at a particular club it may draw on girls from other neighbouring clubs - for example it is recognised that girls from the areas's various minis sections move to this one central club when they reach the age of 12. Anyway, what I have discovered is this. Over most clubs the majority of players in the girls' team come from families who already play rugby, and in most cases they will have fathers or brothers who play rugby for the same club (or "feeder" club). In one case this accounted for 70% of the girls playing, with most of the rest coming in as friends of the 70%. In the worst case around 30% of girls coming into a team are from families already associated with their club. This may seem staggeringly obvious, and I guess it is - but there is one exception to this. Because correct me if I am wrong here but the number of daughters or sisters of players from the male side of the club who currently play for us is not unadjacent to zero (or, if Ruby comes back, one!). A few of you come from families who play rugby elsewhere but even that accounts for under 20% of our playing strength. On the one hand this means we've done an amazing job recruiting players over the past four years - but it also means that somehow we have missed a huge resource right under our noses. Maybe - before we start to hit the schools again, we should be aiming our next recruitment campaign within the club itself? Incidentally there is little correlation between the number of players from "rugby-playing families" and the relative success of a team. The strongest and most successful two teams I asked were also the teams with the largest and smallest numbers of girls from "rugby" families. Little did you know it, but we picked up another trophy on Sunday. I gather that everyone was so cold and wet that you all left before the presentations, but if you had stayed you would have found that we had again won the "Fairplay Trophy" at the National 10s which (when we get it) will look good alongside the one we picked up at East Midlands. Some people say that such trophies are pats on the back and "consolation prizes", and it has to be said that at the Regionals it was remarkable how all the "Fairplay" trophies went to teams finishing third or fourth (moral: you only win by being evil b****ds? ), but I hope that isn't the case - and the regularity with which we win these does (I think) mean there must be something in it. So maybe we should set ourselves an aim - to do the "impossible" win a tournament AND its fairplay trophy at the same time! Or are we just too nice? No - seriously - well done everyone. I think it really does say a lot about how we play the game at this club. And well done to Joe for spotting it! PS. We will be presented with the trophy at the National Sevens on the 26th. All the published information about Sunday is on the Herts blog and pretty much everyone has been to Welwyn before I think, though some special parking arrangements have been made this time (for obvious reasons) - see here for details. Start time is set at 10.30, registration/arrival from 9.30. If we need a "meet" at the club we'll agree the time for it tonight but probably around 9am departure I should think. Unless I've missed it nothing yet about the Nationals on the 26th - but Leighton Buzzard isn't that far either. Thank you for you application to the 2007 RFU President's XV Recognition Awards. The Panel are delighted to announce that Letchworth Garden City has been chosen as the winner in the Category of Modernisation and have therefore been awarded a cheque for £500 for your club. Effective communication with players is always a problem – and especially with juniors. Verbal instructions are forgotten, letters undelivered, newsletters end up at the bottom of muddy bootbags, and even email is unreliable when – as Letchworth’s girls team discovered – most of the players have half a dozen or more addresses each. The girls’ management team therefore decided to try something new – something that better matched the girls’ preferred method of communication. And so was born the Letchworth Girls’ Blog (http://letchworthgirls.blogspot.com/). More than a website, a “blog” is an electronic newsletter which can be updated in real time by any number of editors – in the case of the Letchworth team all the girls’ managers and coaches. This can be done by any computer anywhere – even from a mobile phone – and can incorporate pictures, links, and other simple attachments. In addition the blog has generates an “RSS feed” – producing an electronic alert which can automatically appear on girls’ computer “home pages”, which means that they do not need to regularly check the site, or even their email are – they are alerted to new entries whenever they turn on their computers. The result is a system that is both simple – and extremely powerful. It is easy for anyone to use – no special software is needed, and no training. But the result also meshes almost perfectly with the way that young people communicate today. And there's more. As well as £500 the RFU are giving a further £150 for us to organise a "presentation event" for club members, local dignitaries, the press etc. at which we will be presented with a trophy by some senior person from the RFU (possibly a former or current player). We will also be featured in a forthcoming RFU publication called "Models of Good Practice" which will be sent to every club in the land. This is a BIG THING everyone - anyone any good at organising parties? Phil's photographic record of last Sunday's underwater rugby National 10s Tournament is now available - click here for the thumbnails and here for the slideshow. "Get off me - I can't swim!!" Below are the two 12 woman squads for the final two tournaments of the season. The plan has been to make sure everyone is involved in at least 1 of the 7s squads. Taken into account are players that have made themselves unavailable and players returning to the side. For each squad there is also a reserve player who will be called up in the event that a named player cannot compete. Those that arent selected in the squads are asked to come along and support their team mates in the tournaments and will of course be involved in any celebrations as they are as much of the team as anyone else. If I have left anyone out please let me know asap and I will have to make changes. THESE ARE SUBJECT TO CHANGE AND ARE NOT SET IN STONE!!!! Training Wednesday normal time any kicking training before training to those who want it. Sunday we will meet at the club at 9:00 to leave to make the trip over to Welwyn by 9:15. If u wish to travel direct to Welwyn please meet at the Welwyn RFC at 9:45. John has done/will post an address and any news he has about parking for the day. If you need a lift please let one of us know. National/Regional 10s: what did you think of it? RFUW want your feedback on the 10s - especially as it was the first year it has been run. They have circulated a "standard" reply form asking for marks out of five for things like "Suitability of Venue", "Number of pitches", "Organisation of the Event", "Organisation of the day", "Playing Format", and "Opportunity to purchase Beverages" (why "beverages" should have a capital 'B' I'm not sure...) but the key bit of the form is the final box entitled "Further comments". This box probably matters more than all the above put together so please could I have an idea of what you thought of it all - not just yesterday (aspects of which did not exactly please many of you I gather) but both tournaments, and also the overall "concept". In short - do you want RFUW to do it again? And if so is there anything they could do to improve things (I could think of half-a-dozen but I will refrain from saying what they might be for now)? Email me your responses (however short! ), or bung them on here as comments, or let me know on Wednesday. I am aiming to do a co-ordinated response to RFUW by next weekend so don't delay. By the way apparently we finished fifth, two points ahead of Dorking, with Worcester the overall (unbeaten) champions. Full scores now appear on the Herts blog. Okay,the first little discussion on the National Cup seems to have run its course for the moment (or is beginning to drift off point a bit?) so let’s move on - for now – to another, not unrelated, area that causes even more widespread angst.The calendar. There are two things that I think everyone agrees on with the Calendar. First – it comes out way too late. The first draft for 2007/8 only reached me on 3rdApril – and only after some pressure from Amanda - while the “final”version rarely seems to see the light of day before mid-August, or even September. For all the possible explanations this does make planning things ahead and arranging fixtures a bit of a lottery. Second - its way too crowded to the detriment of clubs. There are some 36 Sundays on the current draft (not including Christmas and Easter).Of these six are county weekends, eight are regional – that is 14 weekends in all, or near 40% of the season when club fixtures are not possible. If you also factor in the fact that we are not supposed to play fixtures in September it restricts the “official” club playing year to only 18 Sundays. Which would not be so bad really if they were well spread out – a game every fortnight would be fine, allowing non-representative players to train in between. But things are not evenly spaced. 20th January to 9th March 2008 is eight weekends – and five of these are regional weekends, including (between regional trials and the first regional game) three weekends in four. This state of affairs does not assist the development of club rugby very much. So why are so many weekends devoted to the development of – by definition – a minority of players? And can anything be done to improve things? The heart of the problem is history (remarkably recent history, in fact). Regional teams seem to have initially been developed when the junior game had a mere smattering of players (ie. 5-6 years ago) with the principle aim being to bring girls together so that they could play full sized matches. Thus the “regional programme” was developed as –and interestingly officially still is – a “development” initiative and NOT an elite representative programme. Come forward to 2007 and things have changed a bit. You now have to go through as selection process not only to get into the regional squads, but just to get to regional trials. That “give girls full games” target has now slipped down to a level to the counties – a curiously unregulated level (especially compared with the micro-managed regional level) that has emerged, rather than having been planned, over the past couple of seasons. As a result we now have two representative levels that dovetail into each other. What this means is that every September (most) counties spend a weekend selecting a county squad. Then over the next two months they spend several weekends working with these girls to form county teams. They then play a couple of games... before the whole structure is thrown away. Because its now January. And every region now spends a weekend selecting a regional squad. Then over the next two months they spend several weekends working with these girls to form regional teams. They then play a couple of games... before the whole structure is thrown away because the season is over. The regional programme also has to squeeze itself around a minefield of other representative programmes including England U19s, England Colleges, etc. etc – as well as facing the unpredictability of the worst period of the season for bad weather. Now, does anyone else feel that this endless cycle of selection, team building, play a game, start again is just a shade wasteful? Even if it didn’t louse up rugby for the (majority!) of girls who do not get into county or regional sides (because with insufficient team-mates or opposition players club games are impossible) the fact is that it is a remarkably inefficient way of going about things. Now I know the theory here. It allows the elite players to be identified by taking girls through a finer and finer mesh, with regional rugby being a higher standard than county, which is itself above club. Except (and I am getting ready to duck at this point) it doesn’t work. The smash-it-down-start-again does NOT result in regional teams that are stronger than county teams (or at least not significantly). Now this is not just a conclusion I reach as a result of my inexpert viewing of games, but based on one fairly good piece of evidence. Its called Yorkshire. Yorkshire are – uniquely – both a county and a region. Same players, same team. If there were a significant difference in standards between the two levels then either Yorkshire would be unstoppable at county rugby OR they would be the weakest region in the country. But they aren’t. They are one of the leading county sides, but not the best, and they are also one of the leading regions. How do they manage this? I suspect because they do not have to break up their team at Christmas and start again – they can carry on with the same squad, same coaches, same management team, developing throughout the season thus probably getting more out of the individual players over time than most other regions can manage. So what is the lesson from all this? Simple – two “development” levels of rugby dovetailed into each other is wasteful, inefficient and ineffective. Get rid of one – and logically that means, for most parts of the country - getting rid of regions. Training and matches spread easily and evenly across an entire season, so fewer sessions needed and plenty of space to organise sessions around England U19s and other, higher, call-ups. No need to worry about weather cancellations as – again – you have the entire season to play with, not just 2-3 months. And no need to shut down club rugby in the springtime. Such a rationalisation would also give benefits for elite players as it would give space for a truly elite level. Using the adult model top players could play at a divisional level, 2-4 “superteam” squads training or playing on county days with professional national coaches in attendance. So what objections might there be? Sorry, Mr Coach, a) they aren't "yours" and b) county is a development level - not an elite. The aim is to develop new players and the game as a whole by giving girls the opportunity to play full-sized games. But truly Elite players need to be stretched, and they won't be in counties - they aren't even at regional level at the moment. RFUW are already proposing to scrap this for U18s, so its clearly not seen as essential by the centre. And the boys tournaments at Rugby are already county events. Hopefully we'll get a more detailed report later, but early news via a mobile phone call indicates that the first ever National 10s finals was a great day out for the girls - until a downpour made the pitches, in the girls' opinions, unplayable. But play still continued. After a win against Dorking (I suspect by about 5-0), the girls had narrowly lost to Welwyn 5-0 and Wimborne 15-0. It was during the ensuing lunch break that the heavens opened, apparently, but the officials insisted that the tournament continue. "So we just messed about", say our informant, "you couldn't take it seriously" and one presumes they also didn't want to risk injuries. As a result they shipped a fair few tries in their final two games against Worcester and "someone else - I can't even remember who it was. Didn't seem to matter" [Paviors, presumably?]. A pity then that such a promising day should end with - reading between the lines here - what I detect to be "a degree of annoyance" shall we say. I suppose the cups have been purchased and medals engraved, "the show must go on" if at all possible, but for our girls - who normally relish muddy conditions - to not want to play means it must have been very wet indeed. That aside its clear that the girls are proud of their performances preceeding the deluge. Let's hope that the competition is repeated next season - but maybe at a rather more sensible time of year? While the U17s were up in Lichfield the search for next "generation" of North Herts girls' rugby was underway at Hatfield in the Herts Youth Games. For the second year it was an U11 tag tournament and for the second year it was a rather damp day. Admittedly not the continual drizzle of 2006 - there were gaps between the showers this time - but it made up for it with a thunderstorm at the end. After some weeks of worry we eventually unearthed a good squad of girls, including four with plenty of contact experience - our own Philippa (captain on the day, as the only "survivor" from the 2006 tournament) plus the Beth and Kate Summerfield and Ales Stevens who all play mixed mini rugby at Hitchin. In addition the district team also included Robyn Godfrey, Isla McLachlan, Alice Sunderland, and Emily Wallis - who have all played tag for their school - and Lauren Armitage, who came to U14 practice last Wednesday. So on paper a good side, and if we had managed to get them all together a little earlier than the day of the Games itself probably they would make a very good side! Fortunately North Herts' first opponents - Hertsmere - pulled out, giving the girls time for a short training session before the first game against Watford. The girls went down 6-4 to what looked a well drilled and experienced team, though a star was born in the second half when Alice came on and showed an incredible turn of speed to score two tries. After a short break came the next game with Stevenage. As they had also lost to Watford this was in effect a quarter final and the team - now playing together well - overturned a 4-3 half-time deficit to win 7-6 and book a place in the semi-finals. Their opponents here were East Herts - historically strong rivals in these games ever since North got them disqualified in 2005. East Herts had unearthed a big side who were clearly used to playing together and their strength overpowered the younger North Herts girls, who to their credit carried on running to the end, despite the odd bruise and bashed nose. And so to the third place play-off. In now pouring rain a tiring North Herts team again could not quite match Watford, but as the thunder rumbled the girls kept trying to the end and were still in great spirits when the final whistle went, barely audible above the thunder. So overall a creditable fourth place - very good for (in essence) a "scratch side" that barely knew each other before the Games. And apart from the four experienced girls who we all knew about, some really talented players emerged, and it can only be hoped that players like Emily, Isla, Robyn, Lauren - and above all Alice - will be able to give the "real" game a try next season. Anyone running a U12 mini team in the area should be seeking to sign these girls up straightaway! Saracens are running a two day rugby "camp" specifically for girls on 24th and 25th July (9.30 to 3.30) at Welwyn which, they say, "will provide a fun and enjoyable environment for female players to develop their game." The two day course is specifically aimed at girls aged between 12 and 17 engaging in contact and will provide an opportunity for players to improve their skills under the guidance of qualified coaches and professional Saracens players. The two day courses allow for significant progression in these areas. The full cost of the two day Camp is £50. Players will need to bring a packed lunch. A £10 deposit will be required to secure a place for this Camp, with the balance payable by June 30th. For further information and an application form please contact Jacky Shutler on shutler4@tiscali.co.uk or 0208 368 5325. As you see - we have a full ten! The tournament is at the Herts Sports Village - there is a map here. The tournament begins at 10.00, with our first game at 10.20. Please aim to arrive by 9.30 at the latest - earlier is possible - as it is likely to be very busy, and you may also have to park away from the Village on the Business Park and use the free bus service. There is also a free coach from Letchworth and Hitchin, if you prefer to use that. Details should have been in the information you received this week - or contact Leanne Fair at NHDC. Bring something to eat - though there will be some food to buy - and a coat etc. as you will be outside all day and the forecast doesn't look too good. Reminder - 7.45am meet for an 8am, departure on Sunday - details here. With seven teams in it they may follow the format of the southern qualifier, which would mean six games so be prepared for a long day. Also remember this - if there are six games you could be looking at 7-minute halves. Frankly, the first team to score in such games invariably win. Stay awake. Joe has also announced the 12-player squad for the Herts Sevens. I've forgotten who is in the team so rather hope Joe will add the details on here, but suffice to say that anyone not in the Herts 7s squad will be in the National 7s squad, though we will delay the final announcement of the latter for a while in case we get injuries. If you are not in a 12 you are asked to still come along if possible as both events will involve significant opposition in hard ground, so 12 may not be enough (it certainly wasn't in 2005!). Good luck - and I will be thinking about you while I am looking after (hopefully) the next generation at Youth Games. "What rattled your cage, then?" That's Joe - straight to the point as usual! To explain, then. Over the past season, thanks to a range of circumstances most notable of which is possibly a tendency for me to have "ideas" (like the stupid one of send the regional team to the USA...) or otherwise stand out a bit by expressing my views on a range of subjects, I have found myself as both Regional Programme Manager and County Manager. And also club and even district manager (there is a lesson here I suspect which probably involves saying "no" occasionally). Anyway it was suggested that maybe the promulgation of contentious writings while occupying these posts might not be a good idea as it would lead to confusion in some parts as to whether or not what was being said was in any way official "policy". Now I would not normally agree because I think people are quite intelligent enough to understand when someone is writing in a personal or "professional" capacity, but when I started getting complaints about my being engaged in the heinous crime of daring to praise or otherwise even highlight the performance of Letchworth girls on a Letchworth blog it seemed clear that sensitivity levels had been ratcheted up to 11 (at least) so it might indeed be a good idea to lay off the more controversial stuff. The regional programme is over, so I am clearly no longer the regional programme manager (except maybe in regard to crossing a few administrative t's). The county season is also over and so I am arguably no longer county manager either (indeed the job has now been advertised). So none of the above constraints now apply. And all the stuff I have been diligently drafting can now come out. Why here, you may ask? Well, where else do you suggest? I somehow don't see the pages of Rugby World being opened up to discussions on the structure of junior girls rugby while every other likely (or even unlikely) outlet is, to some extent, an official site and therefore hamstrung by RFU Regulation 5. But this blog isn't. It is an independent site with no official status, and a reasonable-ish readership. It does stretch the expressed purpose of the site just a bit, but all the subjects that are likely be covered will be relevant to Letchworth, so why not? And if it suggests to the girls the idea that you do not have to accept things as they are - that you can seek to change things that you disagree with - and that a good way of doing that is intelligent open debate, then that would be no bad thing either. The National Cup - what is it for, exactly? [Dear Reader. It is possible that some people of a nervous disposition may become agitated by that which follows, or read into it all sorts of slights which are not there. If that is the case could I first please direct your attention to this note, and secondly suggest that you direct you wrath to a more constructive end by engaging in the discussion via the comments link at the end. Open debate is a wonderful concept - its how we improve things]. With the first ever RFUW Junior 10s this weekend, it was interesting that last weekend the “other” club competition was still an the object of discussion among several people I spoke to at Rugby. Apparently some even have heard that the National Cup is being reviewed – I do not know if that is so, but if it is it is so its not a moment too soon and is a debate that everyone who cares about the club game should be involved in. After all, The National Cup is – or should be - the premier club rugby competition for girls teams. A competition that everyone aspires to, thinks about, dreams about even. But it isn’t. In fact over large swathes of the game its an irrelevance, ignored by the vast majority of clubs. Out of the whole south-eastern quarter of England (containing half of the population of the country) only four teams took part this season. FOUR. And three of them were from Herts. Other areas barely did better than that - over the whole country the number of entrants just about staggered into double figures. The reason for this indifference is simple. To be remotely competitive you not only need to be able to field a full XV (difficult enough for many clubs), but you also need a pretty full subs bench too as opposition player numbers are not reduced if you suffer injuries. In the real world the number of clubs capable of pulling together the 20-25 girls needed directly from their own membership can be counted on the fingers of one hand. With fingers to spare. As a result sides combine forces - as we did this season (and would do next) – or otherwise field “guests” from other clubs. This means that the vast majority of entrants end up being, in effect, artificial combinations created for the sole purpose of entering the cup. When even superpowers like Welwyn feel the need to reinforce their squad with a few "guests" alarm bells should start ringing, and when you hear that the winning team featured players from five different clubs, resulting in a team with a remarkable five TDGs in it (more than most regional sides can manage! ), you do not need to be told that something isn’t quite right. The trouble is that is anyone ever dares to question this or even mumble “erm… just a minute here” the world falls in. “None of these girls could have played otherwise because their own clubs are not big enough” you are told, and “how dare you suggest that anything underhand was going on – no-one is breaking any rules”. You even get threatened with being thrown out of the competition. So please do not think that I am not remotely attempting to have a go or criticise anyone or any club for using the rules to their advantage. I am not – good luck to them. They are not at fault - its the rules. Because fact is that it would be quite stratospherically difficult to break the rules on player selection as, to put it bluntly, there aren’t any. The players do not have to be members of, or registered with, or have previously played for, the club they turn out for. Indeed you do not even have to go to the pretence of entering under the name of an affiliated club at all! There is absolutely nothing to stop Hertfordshire - or even East Region - entering the Cup next year AS Hertfordshire (or East)! Indeed there is nothing to stop someone signing up a complete squad of TDG girls from across the land if they wanted to. So what is the point? What is the RFUW expending all this time, effort – and money – to achieve? Because it clearly isn’t a “club competition” – certainly not one for ordinary rugby clubs representing ordinary communities (unless you define your “community” as an area in excess of 1,000 square miles). It is, in effect, an event for invitational teams – with the winner being potentially less the “best club” as the club with the “best contacts" or the “biggest phone book” – and what does the game gain from that? As a result it is small wonder that most clubs vote with their feet and that consequently winning it carries little glory. I know who won this year as someone told me, but I challenge anyone to tell me who won in 2005/6 as even the RFUW website seems silent on the issue! So why is the RFUW persisting with a format that most clubs do not care about, that generates more ill-feeling than anything else, that forces clubs into something close to a player arms-race, and which has – moreover - been largely abandoned at senior level?After all, its not as if there aren’t alternatives. One idea I have heard suggested is that - if a 15-a-side event is sacrosanct - then eliminate the temptation to cherry-pick superstars and make it an event for “ordinary” club players by simply running the tournament on TDG training weekends. It’s a nice idea – after all the RFUW does damn all for the ordinary player most of the time, other than maybe killing off their season between Christmas and Easter by allowing the regional programme to wipe out every other weekend (or three weekends in four, if the latest draft for 2007/8 goes ahead). But in practice it would require even more combining to go on, and there are plenty of “well-known” girls on the fringe of the TDGs who would become the next targets. So why not regularise the inter-club mixtures by making it a County Cup? After all the RFUW currently does nothing at all for the county game and at least a county-based competition would result in a proper definition of who could, and who could not, play for a given team. RFU have a tried and tested set of rules based on years of experience. Trouble is that, in practice, neither of these solutions help clubs - real, local, individual clubs - the bedrock of the game. What is needed are competitions that even relatively small – but genuine - club sides can reasonably enter on their own. Which brings us to this weekend, and Regional/National 10s. The entry for this wasn't great this season - but stuck at the fag end of the year on hard grounds and clashing with major exams it was hardly set up for success. However fact is that 10s tournaments in the main season work well - look at the Rochford 10s, or Worthing, or Exeter, or... well, many others. Okay some clubs might still be tempted to get in a few, well, "ringers", and in the end that is difficult to legislate against (there is a bit of a contretemps going on in the US over a similar issue), but it would be far more blatant in a 10s so most clubs would not have the brass neck to do it. Well, one lives in hope. Moving the 10s to the main season would also give more space to the evolving "7s circuit" (Dorking, Herts, Nationals) – another format that “real” clubs can enter. It may not be the "proper game", but at least it gets girls playing a form of rugby that is accessible to even the smallest team. So what do you think? Do you agree? Am I barking up the wrong tree? Am I talking nonsense? Do you care? If you do have a view, why not leave a few comments? And while you are about it, why not write to RFUW as well? Regardless of your views – whether you are in favour of the status quo or not – the centre needs to know. They do not have a monopoly on wisdom at Twickenham. RFUW have just asked me to send all our scores in for the season (and - incidentally - are going to ask for official score and teamsheets to be completed for all games - at both age groups - next season). (What is more, in the "exceptional" game - against Hertford - we changed the entire team at half-time when we were well ahead, so arguably its not an exception at all but was in effect two games, one won after going ahead, one lost after going behind). What is more, in most of the games where we have conceeded a try it has been very early on - in the first five minutes. The moral of this seems to be that the opening exchanges in a game - most of time the response to the kick-off - decides the game. If we are awake at the start we win, if we are asleep we lose. Its a lesson East learnt yesterday - and with the festivals coming up its something we need to remember as well. Winning from behind is all well and good if we have an hour or so to do it, its asking a lot if we only have about 15 minutes. Our four regional players played a full part in last ever U17 regional championships at Rugby School yesterday - and came within touching distance of a national title. Nim, Hayley and Sasha all appeared in all four of East Regions games. Hayley, her hand strapped up, made the first major contribution with one of best tries of the day, and one her best ever. Combining her strength to smash through the Yorkshire defence, she sped for the line, outpacing almost everyone, then almost balletically side-stepping the Yorkshire full-back before touching down. Shame this one won't be on video. This was a crucial game for East. Yorkshire had earlier beaten South East by only 5-0, despite having 95% of the ball and spending most of the game on South East's line, so if they beat Yorkshire a semi-final place looked very likely. Hayley's unconverted try was the difference between the two team right up until the end, when a Yorkshire try under the posts looked to have won it... only for Kettering's Lizzel Heather to dramatically charge down the conversion attempt. East then came from behind to beat South East by a larger margin than Yorkshire had managed, and so met South in the semis. Meanwhile Fern was with the East Midlands squad in the other half of the draw. Playing second row she was involved in everything in their hard-fought but crucial win over South West (North), after which she watched her teammates easily defeat Thames Valley to reach the semi-finals as well. East Midlands semi-final kicked off first, and they proved too strong for North East - so could we have a Letchworth v Letchworth final? Unfortunately it was not to be - mistakes at the start cost an early try from which east were never able to recover. But a comfortable win over North East, rounded off with a try from Sasha, secured third place. So to the final, with East Midlands 10-0 up at half time and cruising over South. South pulled a try back in the second half, but seemed unlikely to win - until, on the last move of the game, a tired East Midlands pass was intercepted right in front of the posts to allow South to steal the game, the title, and Fern's winner's medal! Thus ended a long day that didn't see us back in Letchworth until after 8pm - and the South West South team (who were mainly Liskeard, plus a few Exeter Saracens!) unlikely to be home before midnight. Apparently all the southern heats were rolled into one - there were no separate South-West or South-East heats. Not surprisingly perhaps the south-west sides do not seem to have been keen to travel to Petersfield, and Canterbury appear to have opted out as well, so in the end the South heat included seven teams - Reading, Chippenham, Portsmouth, Havant, and Cramberleigh as well as the two qualifiers. So what of our opponents? Welwyn, Wimborne and Paviors we now know well - but what do we know of the other teams? 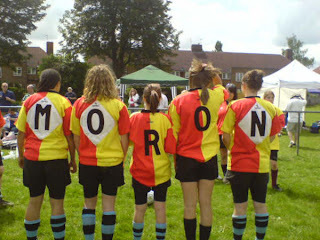 We actually played Worcester in our first season, at the National Sevens. We lost - needless to say - as at that time Worcester were probably the country's leading U17 girls team and we sort-of weren't! Possibly not as strong today as they used to be - or it may be that the rest of the world has caught up - because they finished behind Kettering in the National Cup - but still a potential winner of the event. Recently went on a pioneering (and unbeaten) tour of Ireland (see earlier post on this blog). We will be dogging their footsteps over the next few weeks as they are also at Herts and National 7s - and we have drawn their second team in the former. Dorking, from Surrey, are another famous name in girls rugby. Home of the country's (world's?) biggest girls sevens (even bigger than Herts 7s!) their U14 team was unstoppable a couple of seasons ago and most of that side will now be in the U17 team. Winners of South East League Division 1 - but maybe not quite up there with Wimborne who unaccountably were in Division 2 - they seem to have been largely unbeaten over the season, including wins over a few sides we know such as Beckenham (34-10), Havant (36-17), and Worthing (47-25). Unusually for a southern side they seem to have strong forwards. One positive is that, although they seem to score a lot of points, they always seem to concede as well. The mystery team at the event will be Cockermouth from Cumbria (a little way south of Carlisle). That they call themselves "The Wasps" which may give concerns about a possible colour clash, and they could be our rivals for the "Fairplay" trophy as they were winners of one at a Sevens tournament in Darlington last year. Another interesting thing to note is that town also has a girls rugby league team - which may feature many of the same girls being as it tends to be a summer sport, and which may influence their style of play. Beyond that they have two players in the North East U17 regional squad (who East comfortably beat a few weeks ago), and seem to work with Darlington in a manner not dissimilar (and over a similar distance) to our arrangements with Sudbury. What of the 10s so far, then? Its an experiment and does not currently feature on next season's draft calendar - which is a shame. In my view - despite "low" numbers in some events - it is significant that the 10s format has attracted at least as many entrants in our part of the country (East/East Mids) as the National Cup did, despite the timing, hard ground, and the lack of "tradition". A further pleasant change has been that (by the looks of it) there have been more "real" club sides in this event. There seems to be little evidence so far of TDG-packed multi-club teams, which must be better for the game. I wonder if it is significant that (generally) the most successful heats have been held at clubs with their own junior girls sections? Have other hosts either lacked "contacts", or tended to sit back and wait for the applications come them, or both? Certainly there seems to have been a lack of promotional effort by some hosts. If the tournaments had only been held earlier in the year (before Easter) I suspect the number of clubs taking part would have at least doubled - many teams effectively close down at Easter each season either because of exam pressure (such as Sudbury, for example) , or because they share their grounds with cricket clubs. ... and Fern makes it four! East Region awards: have you voted yet? SuperTeams 2007 - don't miss it!